Easily one of the best films of my childhood and this past weekend I got to see it again in IMAX 3D making me one happy customer. The film is just as great as ever and as I was only 0.4 when this was in theatre’s I never saw it on the big screen and now seeing it in the biggest screen there is I had a real blast. The visuals have aged really well and I did fear an IMAX screen may show more flaws but they did a great job converting the film. The story is a classic now and will always be well remembered for its great story telling and thrilling adventure from start to end. The Characters and dialogue are so memorable and as I always say I like to walk out of a film screening quoting everything! And that’s what you will be doing if you go see it again. I’ll go into much more detail below but for now bookmark this if you are waiting to see the film (WHO?! ), leave any comments below; if you have seen the film I will look forward to hearing your thoughts. 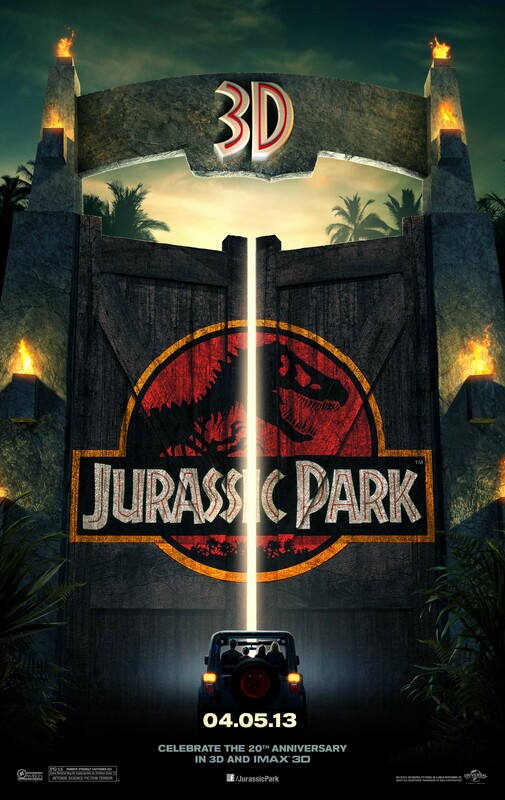 The film follows two dinosaur experts — Dr. Alan Grant (Sam Neill) and Dr. Ellie Sattler Laura Dern) — as they are invited by eccentric millionaire John Hammond (Richard Attenborough) to preview his new amusement park on an island off Costa Rica. By cloning DNA harvested from pre-historic insects, Hammond has been able to create living dinosaurs for his new Jurassic Park, an immense animal preserve housing real brachiosaurs, dilophosaurs, triceratops, velociraptors, and a Tyrannosaur Rex. Accompanied by cynical scientist Ian Malcolm (Jeff Goldblum), who is obsessed with chaos theory, and Hammond’s two grandchildren (Ariana Richards and Joseph Mazzello), they are sent on a tour through Hammond’s new resort in computer controlled touring cars. But as a tropical storm hits the island, knocking out the power supply, and an unscrupulous employee (Wayne Knight) sabotages the system so that he can smuggle dinosaur embryos out of the park, the dinosaurs start to rage out of control. Grant then has to bring Hammond’s grandchildren back to safety as the group is pursued by the gigantic man-eating beasts. 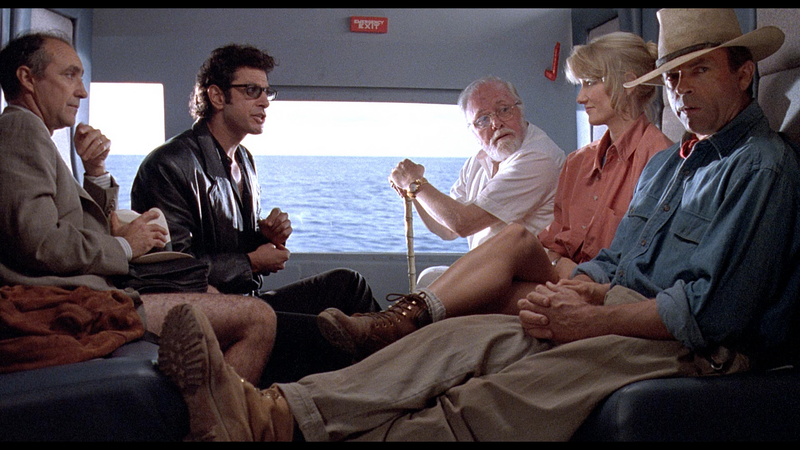 The great thing about Jurassic Park is how easily this could have been a terrible film, but by pure talent and luck this film was made classic. The story is based on a book by Michael Crichton but I have read that and this is quite different, the basic plot is the same but the film had a lot more action adventure and adapting to the big screen isn’t easy so to create a film so well paced and fun is a rare trick to pull off. The acting and characters are a little tricky as some are okay but others are brilliant and as a character study we have a lot of unique characters to see. The characters, especially John Hammond and all the doctors have some brilliantly fun dialogue and some real emotional ones too. My favourite character scenes include John Hammons talk about building something that was real and not trickery, Dr Grant with the kids after he saved them which is a scene I wouldn’t normally like but it’s really a sweet moment, and the lunch scene as Dr. Malcolm explains his fears over what he sees in the park (the quote from the beginning says most of it). You cannot be a science fiction fan without accepting this film as one of the best; I mean come on freaking Dinosaurs people! The science fiction we have here is cloning and futuristic theme park with dinosaurs! Make it happen science. They fully captured what a park like that would look like and how it might work, I only wish that number IV shows a fully working park because I think that will be really cool. How should we treat technological advances with kid gloves or jump right in? I say jump right in, totally not the message of the film but let’s face it I’ll be sacrificing four lives in exchange for us having dinosaurs. It’s hard to believe that this film was made 20 years ago, it must be one of the best examples of visual effects holding up to the test of time. 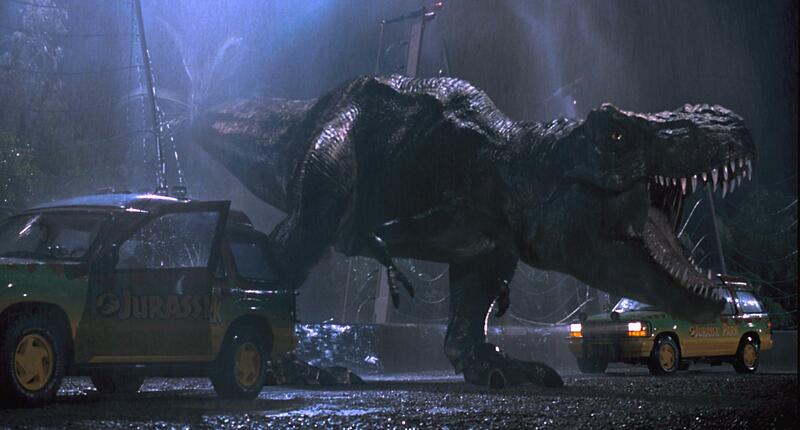 Look at the T-Rex scene and the velociraptors they look great! And the best part is that they aren’t even fleeting shots, we get to see loads of them and they were thrilling to watch because they looked so real as they chased the actors. My personal favourite in visual terms was the excellent T-Rex escape from its paddock, the water tremor, the claw on the fence and then the epic RAOR!!! My favourite scene would have to be “When you gotta go. You got to go” Haha no I really enjoy the Raptors in the kitchen hunting the children; it’s scary and insanely fun with great choreography. I get Goosebumps when I see the big claw taping on the ground, love that stuff. Just like you, I also didn’t see this in cinema. A childhood classic and a total game changer in the world of visual effects. Spielberg is not only a pioneer but has never left being at the forefront of the Hollywood Blockbuster since Jaws, Great review Tim, Im hoping to catch it this weekend at the local IMAX. Yep, the man has been in a class of his own for over three decades. Now that I really think about it… Jaws, Close Encounters, ET, Raiders, Temple of Doom, Last Crusade, Jurassic Park, Schindler’s List, Saving Private Ryan, Lincoln, and, IMO, Empire of the Sun, The Color Purple, A.I., Minority Report and Munich. Not to mention Poltergeist and Gremlins, which he produced but did not direct. The man has directed so many classics and masterpieces, it’s ridiculous. It’s getting pretty dire, but Speilberg is a bastion of class. He’s been a through line in my moviegoing life, too, from Close Encounters (one of the first movies I ever saw) right up through Lincoln. The man has evolved and become more mature (I don’t think we will ever see another movie like Jurassic Park), but he is still the magician he always was. Other filmmakers (Burton, Shyamalan) have thier moments in the sun, but Speilberg is a constant. The 3D didn’t do too much for me, but I still savored the chance to see Jurassic Park on the big screen and I think that’s the whole joy behind this movie. Good review Tim. Thanks dan. Got a favourite scene? Ugh jealous! I was meant to be going to see this but for some reason it’s in a limited amount of cinemas and basically none of the cinemas near me have it *cries forever*. 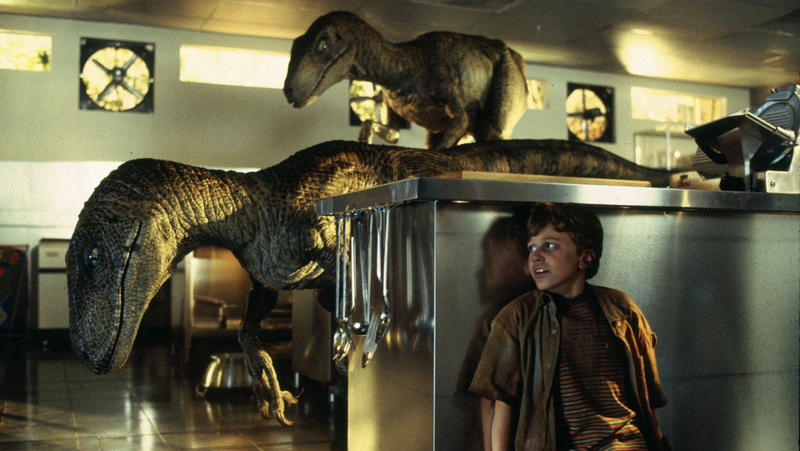 Also, did you know that there were human beings inside the velociraptors in the kitchen scene? No joke. Speilberg understood the importance of balancing CGI with practical effects. I went and saw this in 3D, and I can’t believe how well it’s aged. 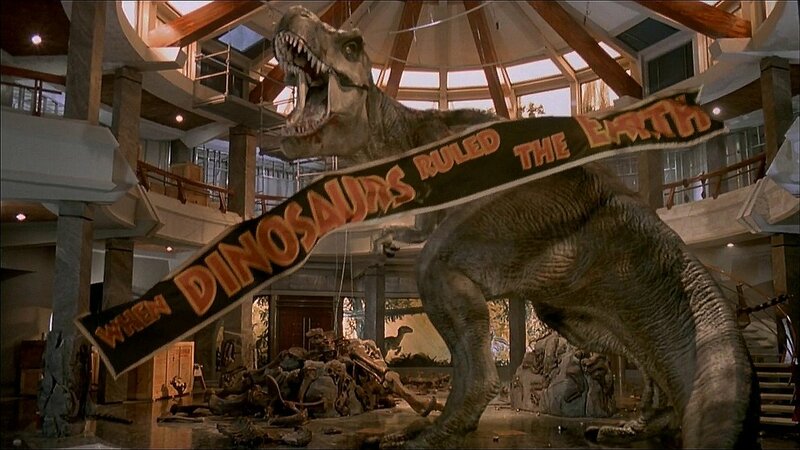 If the computer used by the little girl towards the end of the film had modern graphics on its display, Jurassic Park could have been released this year. Speilberg took a dense and brilliant novel that couldn’t have been easy to adapt, and turned it into a film that was also brilliant, but in an entirely different way. And Jeff Goldblum and Wayne Knight give the performances of thier careers. Did you know that Tim Burton was originally on the short list of possible directors? I read the novel when it first came out, then immediately read it again. It’s the only time in my life I’ve ever done that. 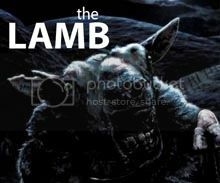 They certainly could have gone in a different direction with the movie, but I’m glad it ended up in Speilberg’s hands. My only complaint is that they softened Hammond too much. In the book, that character is one of the great all-time villains. Yeah, but this was back in the day when Burton was looking like a living god. What’s not to love about Steven Spielberg film with dinosaurs? 😉 This is a great classic, and one of my favorite movies. Thanks for the comment, favourite scene? Man, that’s hard to choose, so many good scenes. I’d probably pick the scene where the T-rex first breaks out of its pen. That scene is still nerve-wracking, even though I’ve seen the movie so many times by now. I would love to see this in 3D. I think I missed it when it came out here. They should bring back more classics in 3D. I saw this twice in 3D, which was very effective. I just loved it so much. 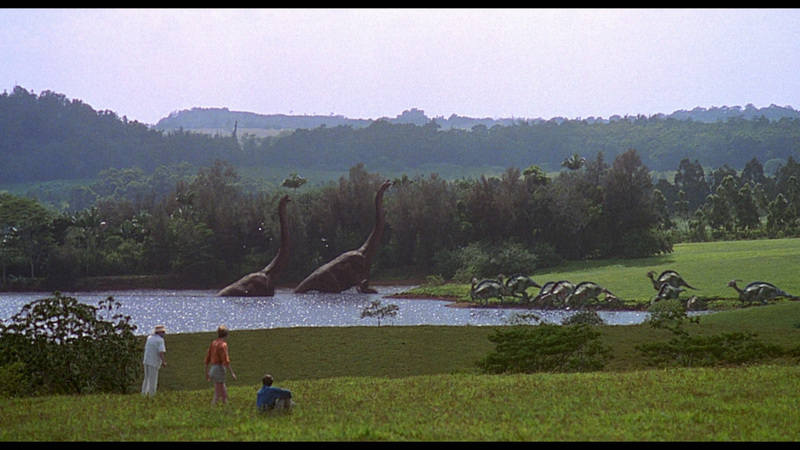 I’d like to see The Lost World in 3D next. This, by far, is one of the the best movies ever made–bar none. I was one of the lucky folks who saw the film in theaters during release in ’93 and I was one of the lucky folks to have seen this in April with my kids in those funky new theater setups. Such, such, such a good movie!!! Definitely agree. What did your kids think of it? Tim I am jealous that you got to check this one out in Imax 3D. Sounds like an awesome experience. I VERY much enjoyed seeing this on the big screen again! and the 3D no less was amazing! You are accurate in your score of this 20yr old film that beats out so many scifi films today! Fave scene will always be the velociraptors chasing the children in the kitchen and then the TREX standing there staking his claim! ha. but I did laugh pretty hard when Timmy flew off of the electric fence because of the shock! I LOVE this one when I first saw it and it still held up upon rewatch too! I’d imagine it looks awesome in 3D, especially the scene when the big T-Rex first shows up! So whats your favourite part of the film? Yep, also one of my highlights this year. I love IMAX, not necessarily 3D for the sake of 3D, but they did a grand job of it here. I really believe that 3D will prove to be a fad—again. IMAX, on the other hand, is the way to go.